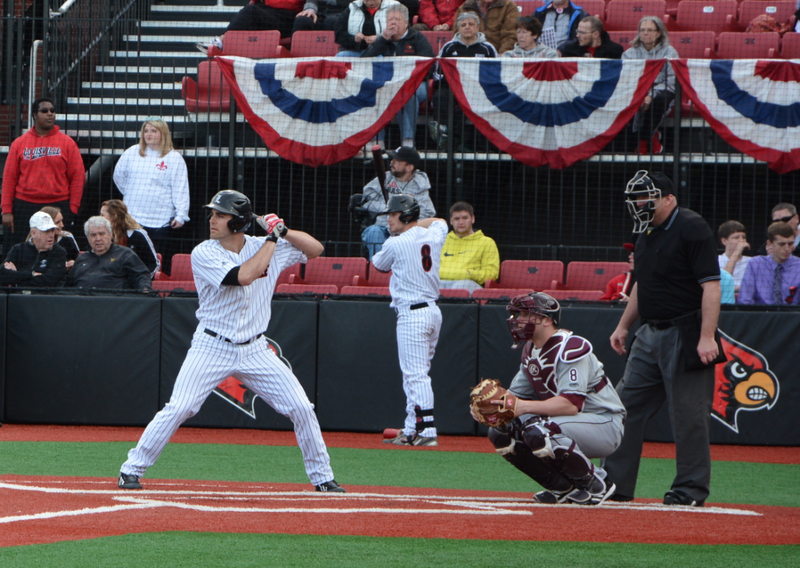 The Cardinal baseball team opened play at Jim Patterson Stadium with a 13-1 victory over the Eastern Kentucky University Colonels. Homeruns from senior catcher Shane Crain and junior shortstop Zach Lucas highlighted a stellar offensive outing for the No. 7 Louisville team. Lucas had a career-high four rbis, leading the team. The Cards had 12 hits in the game, while the Colonels had just four. EKU struck first in the top of the first inning. With runners on second and third, the Colonels’ designated hitter Bryan Soloman grounded out to short,allowing Nowlin to score from third to put EKU up 1-0 early. But it was all Louisville from there. In the bottom of the second, sophomore first baseman Danny Rosenbaum singled to center on the first pitch he saw. Lucas followed that with a single to left to put runners on first and second. Junior centerfielder Mike White hit a sacrifice bunt to advance the runners, and the Colonel’s starting pitcher, Matt Lynch walked Crain to load the bases. Senior third baseman Alex Chittenden hit a 2 RBI single to left field, scoring Rosenbaum and Lucas. Just like that, the Cards were up 2-1. Later, in the bottom of the third, there were runners on first and second, when senior left fielder Jeff Gardner came up to the plate. Gardner knocked an RBI single to left to add to Louisville’s lead. EKU Head Coach Jason Stein took a trip to the mound and replaced Lynch with RHP Brian Mroz. But, Mroz too would struggle against the high-powered Cardinal offense. The first batter Mroz saw was Rosenbaum, who walked, and then Lucas who hit a sac-fly to score junior second baseman Grant Kay. Then White hit an RBI double to score Gardner. But the final blow of the inning would come from Crain. Crain launched a three-run homer over the left field wall, for just the second homerun of his career. After the first homer, the Cards were safely ahead 8-1. The six-run third inning was the highest-scoring frame of the season for Louisville. In the bottom of the sixth, following RBI’s from Kay and freshman Nick Solak, Lucas launched the second three-run homer of the game, to put Louisville on top 13-1, where it would stay for the final three frames. Louisville continues play at Jim Patterson Stadium Friday to kick off a three-game series against Western Michigan.